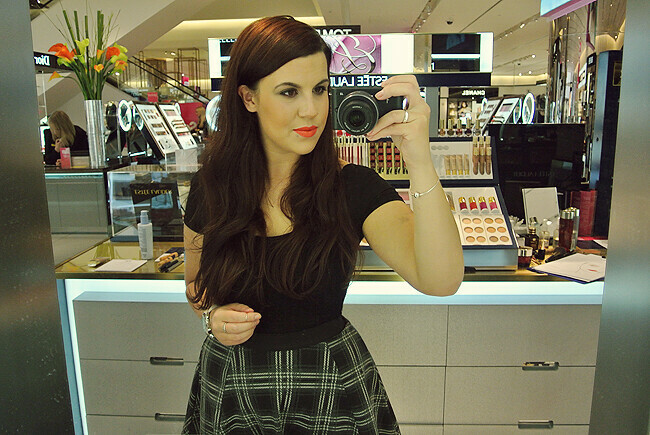 Do you remember this post from a couple of weeks ago where I spoke about the #lipstickenvy event at Selfridges? Well, later that week I headed up to Manchester to have a look for myself which was really fun! I got to see the two new Pure Color Envy shades (exclusive to Selfridges)Pink Ambition and Daring, I'm wearing in the photo. I also was lucky enough to have my make-up done which was lovely. I'd had a really busy morning so it was nice to be pampered for a little bit. Daring was the look I ;went for and daring it was - but I absolutely loved it! I truly believe this look could work for anyone regardless of skintone. 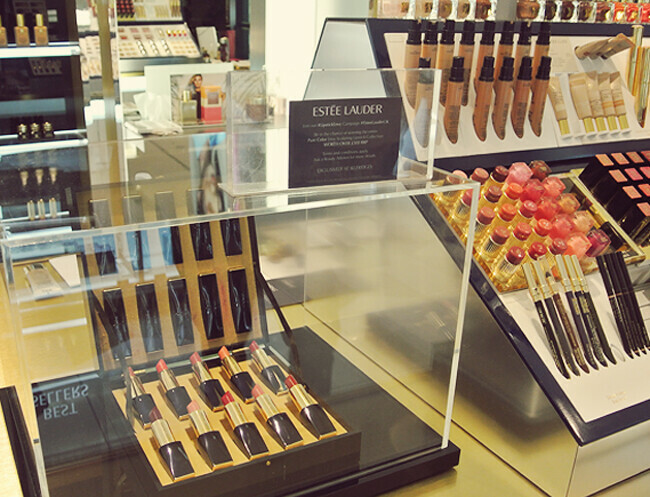 The key thing I love about Estee Lauder's collections are that they're designed for every age and they have such a huge range of colours that you are guaranteed to find one to suit you. On a personal note I recommend adding a bit more of a blacker shade to the outside of my eye lids, but that's just my preference. Whilst I was there I also experienced the 3 minute beauty services available at Estée Lauder counters. Estée Lauder herself was once quoted as saying “3 minutes is beauty should ever take“. The services are designed to be handy, quick and easy techniques for applying your make up, with six techniques to help change your look in minutes: Instant Glow, Instant, Matte, Highlight and Contour,XO Spots, Fatigue Fighter, Modern Wing and Lip Shapeup. You can achieve each look with just 3 – 6 products, followed by a step by step application. Techniques are suitable for any skin, any ethnicity and any age. The lovely make-up artist talked me through the 3 minute beauty tips and explained in such an easy way that since I've been home I've incorporated them into my own beauty routine! One of the best tips I was shown was how to apply bronzer; for the best effects imagine drawing the number 3 - start from your forehead, move down to your cheeks and then finish the shape at your chin. By creating this shape, you add definition to your face. I can't tell you how thrilled I am with the difference this trick has made to the shape of my face! Don't forget the Instaprint machine is still available at all Selfridges! 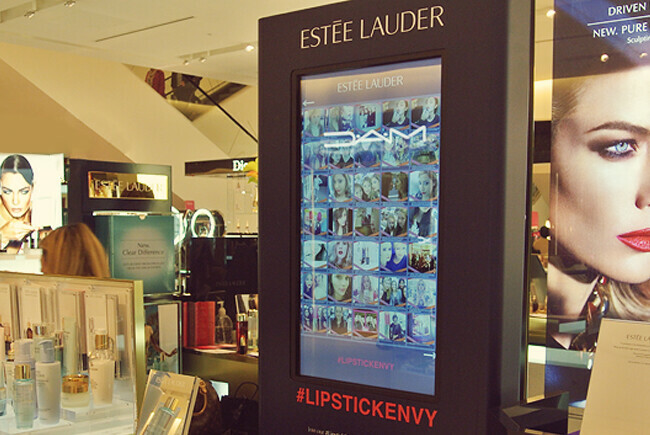 Share your new look by tweeting/instagramming with the #lipstickenvy and @esteelauderuk ­ the machine will print your instaprint at the counter by using the above hashtag you’ll be entered into a competition to win the entire Pure Color Envy Lipstick collection worth over £500! Sounds like it was a good event, and you look gorgeous! The Orange toned lipstick really suits you! In this detailed iPhone & iTunes guide, we will certainly Official Site You have to click any kind of free Application to Download And Install. you shared such good article.